Dubai: Traded value fell by a half on Tuesday amid waning interest from speculators as Dubai index continued its losing streak for another session. Traded value fell to Dh78 million from Dh150 million in the previous session. The Dubai Financial Market general index closed 0.20 per cent lower at 2,493.92. While Dubai equities are oversold and trading at attractive multiples, the macroeconomic landscape in addition to the weighing property market are still of concern for investors at this time. 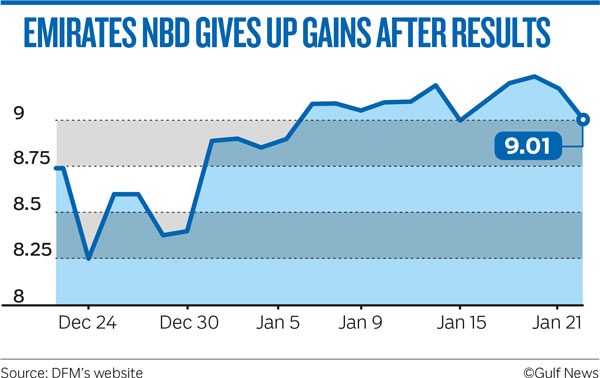 Emirates NBD weighed on the Dubai index closing down 1.74 per cent lower at Dh9.01. Emaar Malls closed 3 per cent lower at Dh1.60. Emaar Properties closed 1 per cent higher at Dh4.04. Emaar Development closed more than 2 per cent lower at Dh 3.81.The Abu Dhabi Securities Exchange general index closed flat at 4,956.02. First Abu Dhabi Bank closed at Dh 14.44, down 0.28 per cent. Etisalat closed 0.24 per cent lower at Dh 16.88. Abu Dhabi Commercial Bank closed 2.63 per cent higher at Dh8.60. In other regional markets, Saudi Arabia’s Tadawul index closed 0.03 per cent lower at 8,399.40. Saudi Cements closed 3.13 per cent lower at 43.30 Saudi riyals. Al Rajhi Bank closed 0.50 per cent lower at 99 riyals. The Qatar exchange general index closed 0.33 per cent lower at 10,687.28. The Muscat MSM 30 index closed 0.06 per cent higher at 4,181.74. The Kuwait all share index closed 0.15 per cent higher at 5,500.88. The Bahrain all share index closed at 1,352.46, up 0.19 per cent. “For the regional markets, the sentiments continued to remain positive, following the trend seen in developed markets coupled with rise in oil prices during the week. Going forward, the regional markets will be driven by annual earnings, especially the outlook for 2019 coupled with the developments on the US and China negotiations,” Allied Investment Partners said in a note. The Dubai Financial Market has been one of the worst regional performers, losing 25 per cent of its value in the past one year. The outlook also depend on the happenings with the global markets. On the other hand, Saudi Arabia’s Tadawul index has jumped more than 16 per cent in the last one year. “The markets have continued the upward trajectory on the back of optimism of potential resolution between the US and China, which could have a positive impact on global economies,” the note added. Global markets have rallied during the month of January to record one of the best monthly gains during the past 30 months.